Charts are used by many designers to illustrate the instructions for complex knitting stitch patterns including fair isle, intarsia, and cable work. Japanese knitting designs use charts almost exclusively over written knitting instructions as the designs are so intricate and complex that if the instructions were written out, you could fill a small book with a single pattern! I use them a lot to work out how a stitch pattern (like a the outline of a foot print in garter stitch) will fit on a block like the one above. 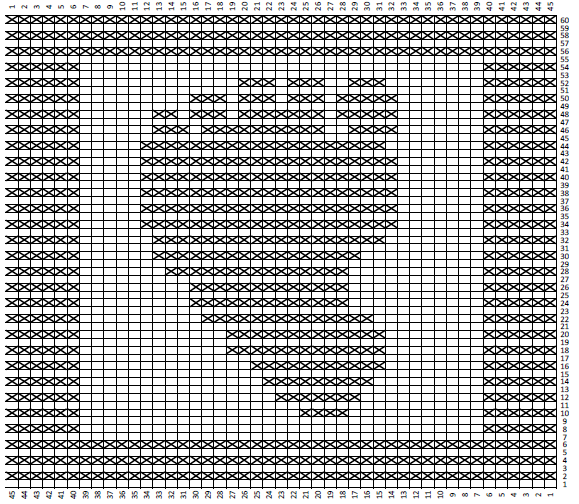 the X represents a knit stitch on a wrong side row to form the foot-print shape on a background of stocking stitch with a garter stitch border. Knitting charts (also called knitting graphics or knitting graphs) are another way to customise your own knitting patterns. Basically you can incorporate your own picture designs into a garment or other knitted item. Do you know how to develop your own graphs? 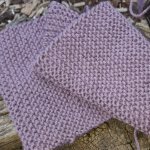 The first thing you need to do is to find a basic pattern for the item you want to knit. For example if you want to knit a child's jumper with a picture on the front, find a basic knitting pattern for a jumper in the size you want. You can find quite a few basic knitting patterns on the beginner knitting patterns page. One of them might be just perfect for your project! The second thing you need to do is to get yourself some graph paper. I used to use ordinary 5mm graph paper that my kids had at school to do maths for years. Although if you are going to use a commercial general purpose graph paper you need to remember that the square on this type of graph paper are square - the length is the same measurement as the width - and your knitting is not, so you may end up with a slightly distorted image on the graph paper as each square will be out of proportion with your knitted stitches. Not sure what I mean? Check the tension on the wool you plan to use. What you will notice is that there are (usually) more rows per 10cm than there are stitches. That means that your stitches are wider than they are tall. So if you use normal graph paper, your design will be too wide in comparison to the height (i.e., short and fat...). As a solution to that particular problem I created a graph sheet that has more accurate proportions and I use it all the time. Would You Like a Printable Copy of the Graph Sheet? Just in case you would like to print out a copy, I have created a pdf version of it that you can download. The third thing you are going to need is either some drawing ability or a printed picture of the item you want to turn into a knitting graphic. Just make sure that the picture is not too fiddly or you will loose too much of the detail when you make your graphic, it also helps if the picture is printed in dark ink with solid blocks of color or a solid dark outline rather than a light pretty picture. The design you are creating needs to fit within the number of stitches you will be knitting. Each square on the graph paper represents one stitch, so you have to make sure that your picture is small enough to fit on the garment. If you want the design to be centred with a bit of room on either side, your picture should be sized or resized to fit within the required number of stitches. So let's say the front piece of your jumper is 100 stitches wide, and you want 20 stitches either side of the picture. You would need to mark out 60 squares on your graph paper and select a picture that fits within them. But remember, the fewer stitches you have to play with, the less detail you will be able to incorporate into the design. The next step is to trace the picture onto your graph paper. I usually just slip the picture under the sheet of graphic paper and trace the outline in pencil. If you design is difficult to see through the paper, you can tape both pieces of paper to a window and the backlight from outside should make it easier to see the design. Make sure it is a sunny day and that there is a lot of light coming through the window!. Another way of doing it is to use a glass top table and sitting an electric lamp underneath. Once you have traced your outline, it is time for a bit of colouring in! You will probably have quite a few lines in your design that run across squares on the graph paper, ignore those for the moment and concentrate on all of the square fully enclosed within the lines. You can either literally colour in the squares using different coloured pens or pencils or you can use symbols to highlight the different colours in your design. I use blanks squares for the background, and a different symbol for each other colour. You can use x's o's, and lines (up and down, across or from corner to corner). Once you have all of those squares marked, it is time to have a look at the squares that are only partially included in the design. What I usually do is to colour in the squares that have 'most' of their area within the lines - say more than half, and leave the rest blank. You can tidy up the edges of your design after you have finished knitting the piece by embroidering and outline around the design. To finish your DIY knitting chart and make it a bit easier to read as you are knitting, you can add row and stitch numbers along the sides and bottom of the design.